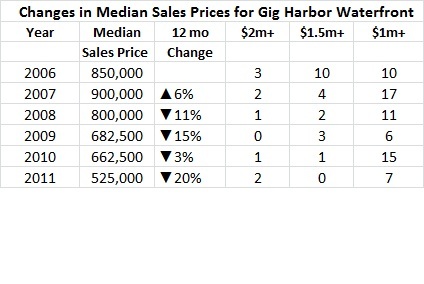 A little good news for Gig Harbor waterfront sellers at the beginning of 2012—median prices are up 10% over 2011’s dismal showing. Plus sales are definitely up—the first year since 2003 we have closed 13 homes in the first two months. 2011’s 4th quarter strong activity was due to a “perfect storm” of buying conditions…historically low interest rates, a perception the market was bottoming, and “pent-up demand” by sellers to sell. Homeowners ask me how market conditions have affected the value of their Gig Harbor waterfront home. During the downturn I have tried to provide perspective to this each year. Here are 2011’s statistics, with my comments. 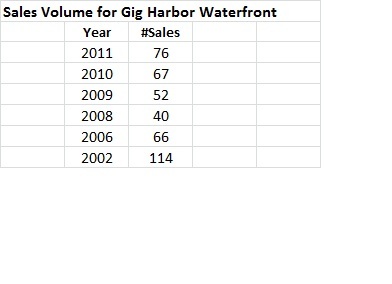 While 2007 was the year the median sales price for Gig Harbor waterfront reached its peak, it was also the year the market started to decline. Prices have dropped 43% overall from 2007 to 2011 and now reside where they were in 2004. Factoring in the first two months of 2012 sales, the Gig Harbor waterfront median price is now down 36% from the pinnacle. The Gig Harbor peninsula actually experienced a slight uptick in prices in 2011 while Key Peninsula dropped. 13% of the sales last year were bank-owned homes and 9% short-sales. This was higher than 2010 with only 17% in these two categories. In most cases short sale homes sold just below the county assessed value. But bank-owned waterfront homes sold for 25-45% less than assessed value. 17% fewer Gig Harbor waterfront homes are on the market compared to a year ago. This slim inventory—coupled with fewer foreclosed waterfront homes, still low interest rates and gradually loosing financing should bring a strong spring selling season and improving prices for sellers in 2012. And March is historically the month more contracts are written than any other. If you would like more information about Gig Harbor waterfront or have just a question, I would be happy to talk with you. You may email me at Carole@Gig Harbor-Waterfront.com or call me at 253.549.6611.